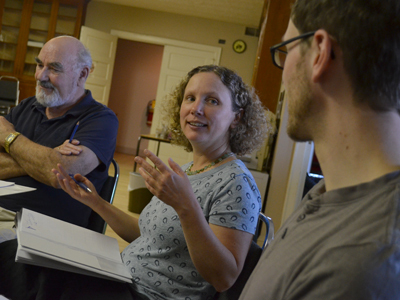 Aspiring playwright Lara Bradley explains a concept to director Matthew Heiti as a group of actors, including Ron Tough, and Pat The Dog Playwright Centre help her develop her script. Photo by Jenny Jelen. When ore is smelted, it becomes refined. When plays are smelted, they, too, become more polished. Except instead of roasting scripts and burning dialogue, an animated conversation between a group of actors, an experienced playwright, an aspiring playwright and Pat The Dog Playwright Centre takes place. Matthew Heiti sat at the head of the table, directing the conversation between the different perspectives. As constructive criticism and curious questions were presented to Lara Bradley for her piece “Blind Nickel Pig,” he reminded her several times that the group was just “tightening the screws,” making her debut effort stronger, sharper and cleaner. Bradley is one of four aspiring playwrights having her piece picked apart in the group format. She and Rick Duthie, Cora Eckert and Emil Sher have works in the program. Lisa O’Connell, artistic director of Pat the Dog, called Bradley’s a “really promising young play.” “Blind Nickel Pig” is a “rollicking piece, inspired by burlesque and vaudeville, about the early days of prohibition-era Sudbury.” During one of three full-day development sessions, the team of professionals helped Bradley develop the piece by making her examine major aspects of character, plot and the finer points of setting — right down to the subtle nuances about why characters spoke a certain way, how the dialogue advanced the script and why she chose to include a sock puppet. “It’s the birth of a really exciting play,” O’Connell said. For Bradley, it was a whirlwind learning experience. “They ask you many, many questions,” Bradley said. “Why did I make these choices? I don’t really have the answers to a lot of questions.” While her background is in writing, the former journalist said putting words into people’s mouths as a playwright is an entirely different challenge. “It’s neat to make up what they’re going to say,” she said. Her story was inspired by research she did about historic Sudbury. A tale that caught her attention concerned two sisters who escaped from jail. They would became the genesis for her story. Her research also led her to “blind pigs,” a strange expression referring to after-hours bars. A heavy police crackdown saw the end of the blind pigs, but not before Bradley was compelled to give the truth a fictitious twist for her play. “For me, this is pretty exciting, hearing people read these lines,” she said. Heiti, too, was enthusiastic about how her script, “a piece that plays with history,” was coming along. On May 12, “Blind Nickel Pig” will be read by actors during the “smelting” process. Between now and then, they will continue to hone and refine the piece, bringing it more fully to life. The community is invited to catch the pay-what-you-can (suggested minimum is $10) reading, which gets started at 7 p.m. at the Jubilee Centre on Applegrove Street. The reading will be followed by a discussion in which the audience can help take the play to its next step in development. May 9: “What Struck in ’58” by Rick Duthie, a sweeping epic about the first Inco strike. May 10: “Aftercare” by Cora Eckert, a twisted dramatic comedy about a family in turmoil. May 11: “Conviction” by Emil Sher, a stirring docu-drama about the Charles Smith pathology cases that shook communities such as Sudbury and the Sault. The weekend also features Playwriting Intensives for budding writers. Pat The Dog will offer group discussions on script development, adaptation, the business of playwriting as well as a directors’ roundtable. For more information or to be part of the workshops, email matthew@patthedog.org or phone 705-207-7849.